"The History and Topographical Survey of the County of Kent (1800) Edward Hasted"
By email dated 20 March 2017 Dover District Council confirmed that "Deal Pier is not a listed structure." Constructed predominantly from concrete-clad steel, the third (current) Deal Pier is 1,026 ft (311 metres) in length. A notice announces that it is the same length as the RMS Titanic, but that ship was just 882 feet 9 inches (269.06 metres) in length. Deal has had three piers to delight townsfolk and holidaymakers alike. Many schemes have been put forward over the centuries for the construction of a harbour for the commercial advantage of the town, but none of those plans came to fruition. To land passengers or cargoes on the open beach in an open boat has always proved a risky business particularly when the sea is rough. To overcome this problem a company was established in 1838 to construct a wooden landing pier or jetty as a substitute for a harbour. An Act of Parliament was obtained sanctioning the formation of The Deal Pier Company with a capital of £21,000 and a plot of ground immediately to the north of the Royal Hotel was purchased. The celebrated engineer, Sir John Rennie (1794 - 1874) who had been responsible for the construction of London Bridge, was commissioned to design a pier 445 feet in length. Piling was completed for a length of 225 feet at a cost of £12,000 and a further sum of £8,500 was then raised by the issue of five pound shares. Tolls imposed on goods carried onto the pier brought in further monies. 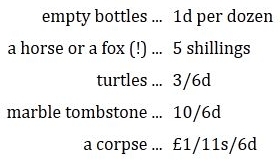 Some of these old tariffs make puzzling reading. 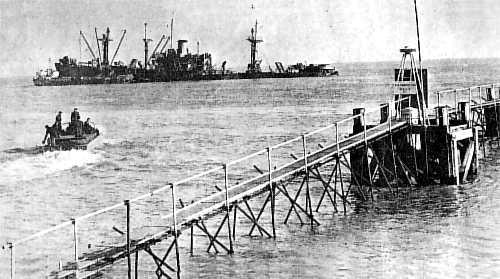 Sufficient funds being lacking, however, this first wooden pier was never completed and it remained for many years projecting from the shore, an eye-sore and a constant hazard to shipping. Each year the pier suffered the violence of the winter storms and the structure was weakened still further by attacks from sandworm, peculiar to this coast. Finally, in 1857, a sudden gale brought the whole structure down - almost to the relief of everyone - and the materials when auctioned realised a mere £50. Stone work at the entrance to the pier remained upon the beach for a long time and occasionally wooden stumps which formed part of the lower construction are uncovered during the lowest of neap tides. A short alley leading off nearby Oak Street bears the name Wood Yard where wooden spars and other timber were stored for maintenance of this, the first of Deal's piers. Mr Edward Hayward, originator, editor and proprietor of the Deal Telegram, a weekly newspaper which made its first appearance on 27th January 1858, campaigned indefatigably for the construction of a new pier, both in the columns of his journal and among the townsfolk privately. As a result of his efforts The Deal and Walmer Pier Company Ltd was incorporated in September 1861 and, after another Act of Parliament was obtained, work on this new venture commenced. The structure was designed by Eugenius Birch, civil engineer of London, and the contract for erecting it was entrusted to Messrs R. Laidlaw and Son of Glasgow. In the spring of 1863, Mr Knatchbull-Hugessen, Senior, member for Sandwich, Deal and Walmer, drove the first pile of the new pier in the presence of a large number of townsfolk. Details of the construction were placed in a tin box and deposited in the first column. By August the abutment had been built from stones brought from Sandown Castle which was by then in the course of demolition. 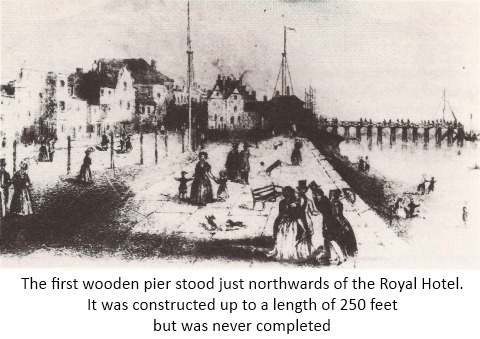 The new pier was one thousand feet long, constructed of wrought and cast iron and was supported upon cast iron columns which were screwed into the ground. It had seating accommodation along its entire length, was illuminated by attractive globe-shaped lanterns and had in the centre a tramway for conveying goods and luggage. There were three decks - promenade, fishing and small boat - and at the promenade level was a café-bar and concert hall. 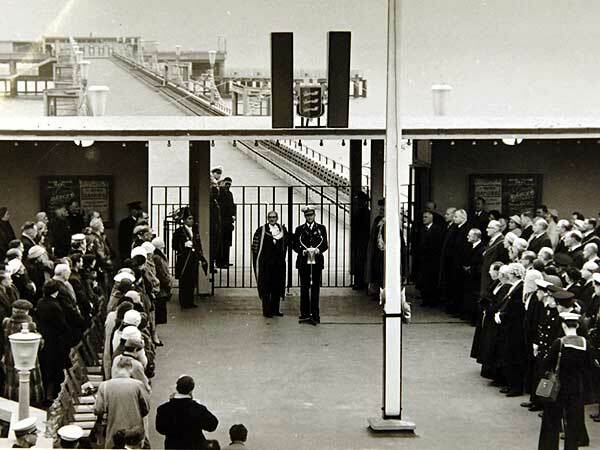 The ceremonial opening took place on 14th July 1864, when all the troops of Walmer turned out to line the pier. The Mayor and Corporation, directors and workmen, with the bands of the Royal Marine Depot and the 6th Depot Battalion, paraded the streets and proceeded to the pier, where the Mayor declared the structure open to the public. Mrs Fowler-Burton, wife of the Depot Commandant, was the first lady to pay the toll and pass on to the pier. "There was a great concourse of spectators around the flagstaff at the pier-head to witness this ceremony, which was performed by Mrs Hugessen, wife of the borough member, who had herself, in April 1863, inaugurated the commencement of the work. The lady took her seat in a chair which was placed on a truck and drawn along the tramway to the end of the pier. 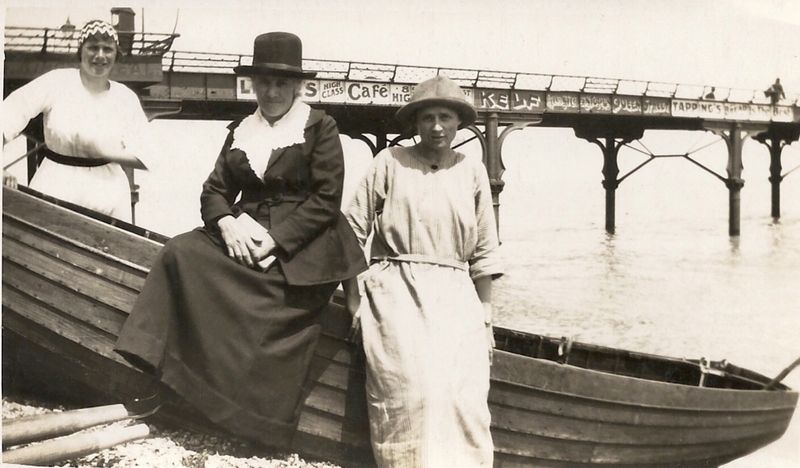 She then declared the pier opened, and congratulated the Deal and Walmer Pier Company, as well as the town of Deal, upon the completion of this useful structure. There was afterwards a banquet at the New Assembly Room. Mr John Attwell, chairman of the company, presided; and among the guests was Lord Clarence Paget, the Secretary to the Admiralty, besides the county and borough members. Lord Clarence Paget highly commended the erection of the pier to give a readier access to the Downs roadstead and hinted that if the charges were not too exorbitant the Government might be disposed to use the Deal pier for the embarkation of troops. It is expected that this accommodation will induce many persons to land at Deal from ships passing up the Channel." 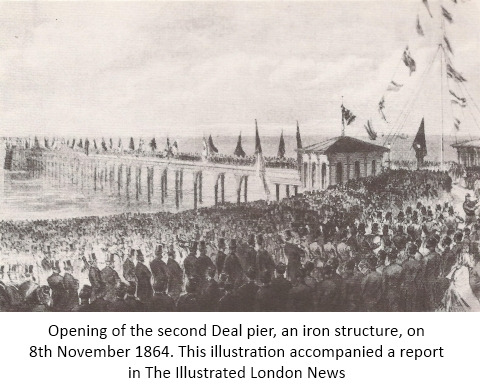 The new pier, having reached completion, was formally opened on Tuesday with great éclât, the ceremony being performed by Mrs. E. H. Knatchbull-Hugessen. The pier is constructed entirely of iron; it is 1,100 feet long, 26 feet wide; it has a T shape, and the head is 120 feet long and 50 wide, the abutment being 100 feet by 407. The body of the pier rests on about fifty ornamental iron columns of about 18 inches In diameter, which are screwed into the rock; they are tied horizontally by diagonal braces of wrought iron, and are surmounted by ornamental caps. The pier head, where steamers can be moored alongside in any state of the tide, rests on the same kind of pillars as the body of the pier, but for greater strength they are tied diagonally, vertically, and horizontally, and are surrounded by a timber fender. The work has been executed under the immediate direction of Mr. Reid, the superintendent. Along each side of the pier is ranged a continuous seat, the back formed of an iron network, which forms an elegant finish to the top of the structure. The whole pier is said to be of very great strength. It is wonderfully light in appearance, and from the character of its construction offers a very slight resistance, either to the violence of the wind or the sea. At the entrance there are two very prettily-designed toll-houses, and at the head there is a corresponding shelter house, which it is expected will be used as a reading-room. In every respect it is a work which the town may well be proud of possessing. Mr. J. M'Millan was secretary to the undertaking ; Mr. E. Birch, M.I.C.S., acted as engineer; and Messrs. Laidlaw and Son, of Glasgow,, undertook the actual erection of the pier. At noon on Tuesday a procession was formed at the Naval Yard, and consisted of the directors and shareholders of the company, the workmen of the pier, the various clubs and friendly associations of the town, wearing their honorary distinctions and official regalia, each party being headed by an excellent band. The Worshipful Mayor and municipal body and clergy also co-operated and took a distinguished part in the spectacle. Altogether the sight was very attractive, and the multitude that streamed from all quarters to witness it furnished the best evidence of the interest taken in the event. For a day in bleak November, the weather was as favourable as could be expected. The procession having walked round the town returned to the Clarendon, and thence proceeded to the pier, which had been lined by this time from end to end, through the courtesy of Colonel Fellowes and Major Hughes, with troops, from the dépôt. Flags and banners floated in all directions, and the scene was an exceedingly gay and animated one. A truck was carpeted and decorated, and an easy chair placed in it, and about two o'clock Mrs. Hugessen took her seat upon it, and was drawn by the workmen to the pier-head. Three cheers having been given the Chairman invited the lady to open the pier. "I thank you for the honour you have done m in wishing me to take part in the interesting proceedings of this day. I congratulate you upon the successful termination of your undertaking, the result of which we see in this beautiful pier. I hope it will contribute to the prosperity of your town, in which I feel I shall always take so much interest. I have much pleasure in declaring the pier now opened." [loud cheers]. Three cheers were then given for Mrs. Hugeseen, for the county and borough members, for the contractor, the engineer, and the company. "Madam, I have the honour to inform you that at a full meeting of the directors and officers of the company it was resolved unanimously that the most cordial thanks of the board be conveyed to Mrs. Hugessen for her kindness in consenting to attend and formally open their structure which was so happily commenced by Mr. Hugessen in April 1863, and that Mrs. Hugessen be requested to accept a pictorial illustration of the pier as a memorial of the auspicious event; the same to bear the signatures of the chairman, directors and officers of the company." Mrs. Hugessen was then drawn back to the entrance to the pier, and this brought the proceedings at the pier to a close. A large party afterwards sat down to dinner at the New Assembly Rooms ; Mr. Outwin, of the Clarendon, providing an excellent dinner. Mr. John Atwell, the chairman of the company, presided, and there were present Lord Clarence Paget, M. P., Sir Brook Bridges, M. P., Sir E. Dering, M. P., Mr. Hugessen, M. P., Mr. Laidlaw:, Mr. E. Birch, Mr. Browne, Mr. M'Millan, the Mayor (W. M. Cavell, Esq.) and members of the Corporation of Deal, and several of the most influential inhabitants. After the cloth had been removed, the usual loyal toasts were drank, followed by the "Army, Navy and Volunteers". Colonel Fowler responded for the army, and Lord Clarence Paget for the navy. In the course o f his remarks, his Lordship said, from the erection of this pier, whenever it was necessary to collect a squadron in the Downs they had an easy and facile access to the shore; this pier would be of the greatest importance in rendering communication with the ships in the Downs perfectly secure. As a public officer he must say they had a considerable garrison, they had a magnificent body of marines and a considerable depôt of troops in this district, and he should recommend them so to frame their charges that they would tempt the government to embark troops from this pier. They had now the pier: they would shortly no doubt have good houses where the Naval Yard now stood, and Deal might then well become the rival of Dover and Ramsgate. The Chairman having proposed "The Bishops, Clergy and Ministers of all Denominations", to which the Rev. T. L. Griffith responded. Sir Brook Bridges, in giving the health of "The Lord Warden of the Cinque Ports", expressed his sincere congratulations to the town and all connected with the enterprise, on the successful completion of this important work. The Chairman next proposed "The Health of Mrs. Hugessen", which was drunk with much cheering. Mr. Hugessen returned them most sincere thanks on behalf of Mrs. Hugessen, and then went on to propose "Success to the Deal Pier". Although it was always a pleasure to come amongst them he never rose with feelings of greater or more unqualified satisfaction to address his constituents than he did that night. He recognised in the proceedings of that day the fact that Deal was about to take her proper place among the seaport towns; the spirit of improvement was abroad, and they might look to the future for increased prosperity. Mr. Davison briefly returned thanks. Mr. E. Browne then proposed "The County and Borough Members". Lord C. Paget responded, and gave "The Mayor and Town Council of Deal". The Mayor (Mr. W. M. Cavell) briefly replied, expressing his great satisfaction that the pier was completed so nobly. Mr. Hughes proposed "The Chairman and the Directors of the Pier" to which the Chairman briefly responded. Mr. Hugessen gave "The Engineer (Mr. E. Birch), the Secretary (Mr. J. M'Millan), the Solicitors, and the Superintendent (Mr. Reid )". Mr. Birch, in a very neat speech, responded; and some toasts of a minor character having been disposed of, the party broke up. Sad to relate, this new venture did not turn out to be the success that had been anticipated and in 1866 the Pier Company was wound up. As a large amount of money was still owing to the contractors, the pier eventually passed into their hands. The constructional engineers finished, managed and improved the pier over a period of 54 years after which time (1920) the Deal Borough Council purchased it for £10,000. "a most charming retreat when in search of health from the penetrating effects of sea breezes. Here, on this Pier, one can imagine himself on the deck of some huge vessel in the Downs at anchor, enjoying the invigorating and life-giving effects of a sea voyage in the Channel." "… at the very entrance is a reading-room where you may read all the London papers, the local journals - for the small charge of one penny. At the end of the pier are salt baths, where those who fear to trust themselves alone in the water may with perfect safety obtain all the medicinal advantages of the sea-water bathe. 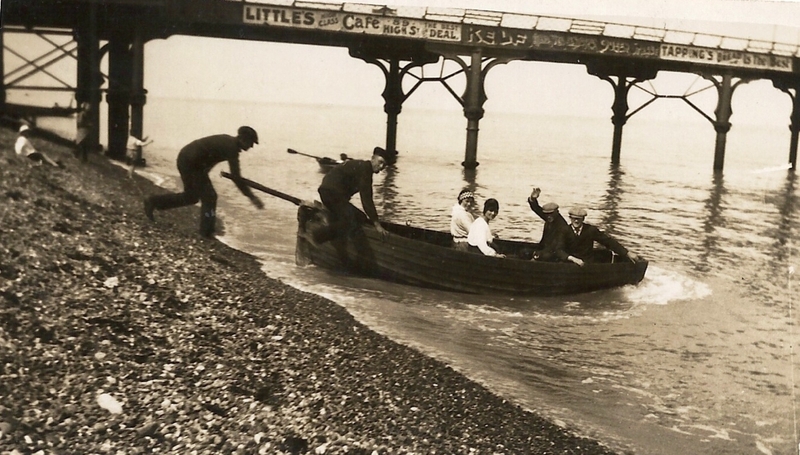 The pier itself is a splendid marine parade, and here the society of Deal do congregate at all hours of the day. Everything is done to cheer them, and make their maritime pedestrian agreeable, for during the seaside season a band, paid for by the inhabitants, plays morning and evening a selection of the best airs of the Cecilian art." "The silver whiting is one of the gamest of sea fish, and much resembles the river perch in its bold biting and plucky struggles to escape ... no prettier sport can be had. The codling, although a heavier fish, simply gives two or three plunges, and then seems to open his capacious mouth and take in as much of the surrounding water as he can encompass, to assist him in putting on as much dead strain as possible to check your persuasive efforts." 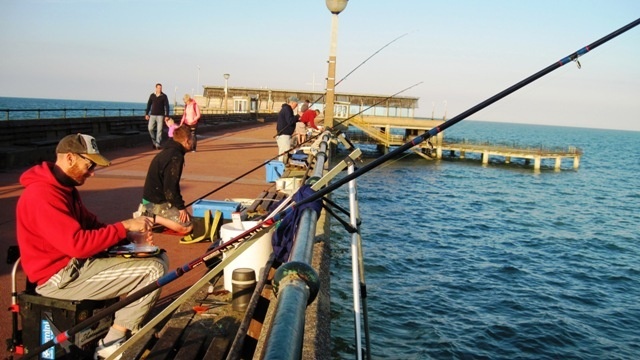 "One of the best places for pier fishing on our south-east coast is Deal. Here the angler will find all his wants supplied, every kind of bait necessary being furnished on the pier, under the superintendance of the genial pier master, Mr Lawrence." The Pier Master was, naturally, a much respected personage in the town and a dignified figure he cut in his elaborate nautical-style uniform. 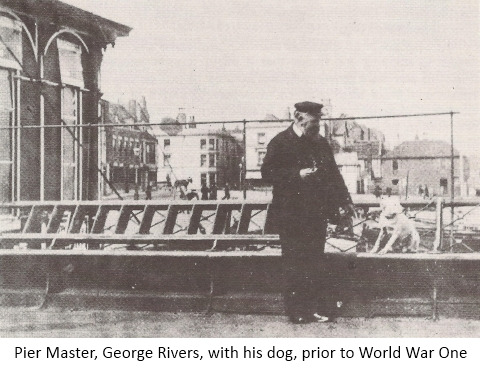 One of the most jovial of the breed was Mr George Rivers who, in the slow moving days prior to World War One, was often to be seen parading the pier in the company of his faithful hound. Tragedy struck the pier on several occasions. In 1871 occurred the sad loss of a renowned local lugger, 'Reform', which was launched in a gale to answer a distress signal. Weather conditions were so appalling that the moment to cast off the rope could not be accurately timed. Disastrously, the famous lugger was pulled around onto the pier where it sank between the piles with the loss of eight members out of a crew of eleven. 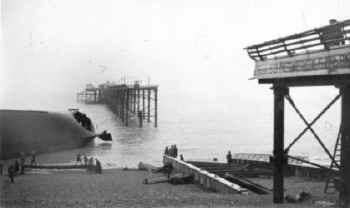 Nobly, the pier survived buffetings from other ships. During a storm in January 1873 the barque 'Merle' hit and badly damaged the structure and in the same month, 1884, the schooner 'Alliance' crashed into the pier and carried away several columns. 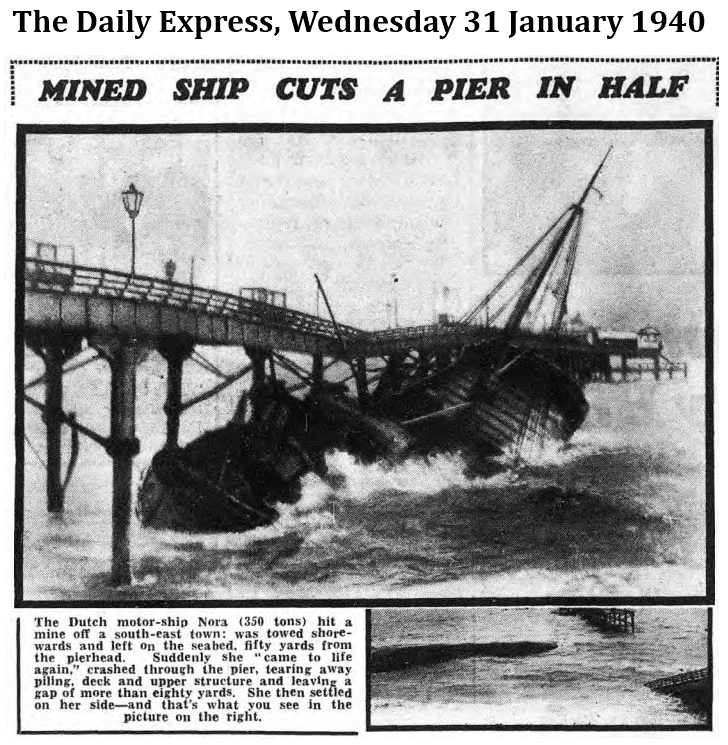 But it was the incident involving the Dutch ship 'Nora' which signalled the end of Deal's second pier. The 350 ton motor-driven vessel 'Nora' carrying a cargo of straw boards, had been anchored about a mile off shore when on the morning of 29th January 1940 she was struck by a drifting magnetic mine and a huge hole was blown in her stern. The cook was injured when the galley was demolished, the captain and mate were hurt in the wheelhouse and a crewman was blown overboard by the force of the explosion. Fortunately, he managed to keep himself afloat before being picked up by a patrol boat. The same vessel rescued the remainder of the crew while salvage tugs took the 'Nora' in tow and succeeded in beaching her fifty yards southwards of the pier. There she lay for some time almost completely submerged but the rising tide lifted her from the beach and, as the flood tide gathered strength, the danger to the pier became apparent. 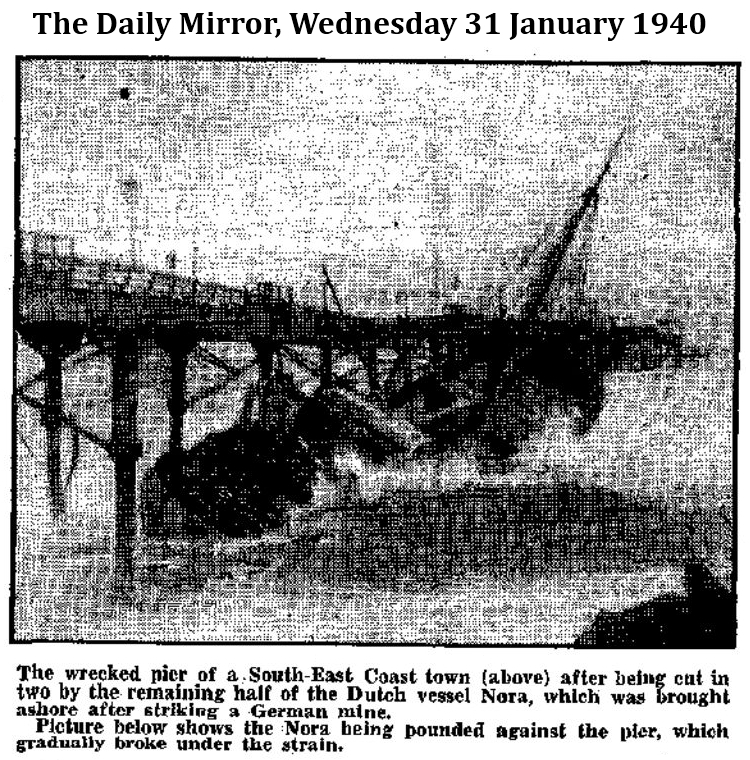 Several stragglers who happened to be on the promenade deck raced ashore in time to watch horrified as the 'Nora' crashed broadside into the pier. 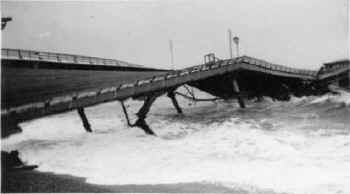 A heavy sea and a strong tide repeatedly hurled the crippled vessel against the shore end of the pier which withstood the buffeting for some while and then collapsed. 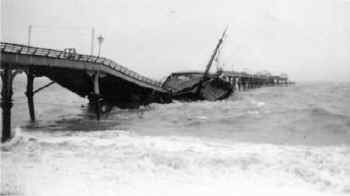 Finally, the 'Nora' was driven clean through the structure and came to rest on the beach just northwards of the pier carrying part of the wreckage with it. Many attempts were made to float the 'Nora' but without success and during the early part of the war she remained a pathetic spectacle lying upside down beside the pier she had mortally wounded, until the tides and rough seas carried her further northwards. The remaining two-thirds of the pier was blown up later that year by the Royal Engineers because it obstructed the field of fire of coastal guns erected on the sea front after the fall of France. The decision to demolish the pier was probably taken by Churchill himself who had visited the town to appraise our coastal defences. In the spring of 1943 a brick-built lookout post was erected at the entrance to the pier and all that remained of this fine structure were the twin Victorian toll-houses which had featured in so many pictures of the pier throughout its eventful history. 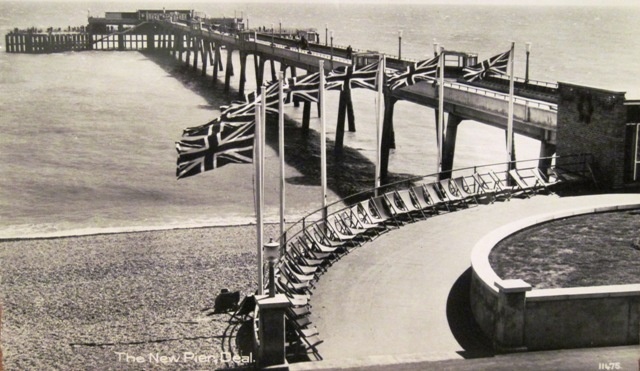 The third Deal pier - the only pleasure pier to be constructed since the war - is built on the site of the one it replaces. It was officially opened on Tuesday, 19th November 1957 by H.R.H. Prince Philip, Duke of Edinburgh. The band of the Royal Marines, a Guard of Honour and a very large concourse of people attended the grand opening ceremony. A presentation key made by Thomas Fattorini can be seen in the Town Hall. The design of this ceremonial key embodies the Ducal Coronet in silver gilt and enamel, and the Arms of the Borough on both sides, parcel gilt in blue and red enamel. A trident and rope border denote Deal's maritime associations. The present pier was designed by Sir William Halcrow and Partners, the Council's consultant engineers, to the requirements of the Council, and was built by Concrete Piling Ltd. Constructed of reinforced concrete it has a one thousand feet stem with almost one third of a mile of open seating. At seaward end of the approach is a three deck pier head set at right angles to the approach and parallel to the coast. At promenade level there is a lounge café, bar and terraced area. Below is the main landing and fishing deck with angled wings to increase berthing facilities for pleasure steamers. At the lowest level there is a 'half-tide' small boat landing deck beneath each wing area. Total cost: £250,000. Recent storms have wrought havoc with the piers at Herne Bay and Margate, leaving Deal the only remaining pleasure pier in Kent. An invigorating stroll along its stem is rewarded by a spectacular panorama of the coastline stretching from Kingsdown Cliffs southwards to an extensive sweep of Thanet in the north. And, in between, is the enchanting townscape of Deal with its orderly row of quaint 18th and 19th century cottages - each with a different arrangement of doors and windows and an individually-shaped roof - interspersed with local landmarks: the Royal Marines Barracks, time ball tower and three low, squat Tudor fortresses, behind which peer the numerous cupolas and spires of churches and chapels beyond. Pleasure craft and local fishing boats frequent home waters while hovercraft from Pegwell Bay skim the Goodwins and cross-Channel ferries make their more leisurely crossing from the shelter of Dover Harbour to the dimly-viewed coast of France. The Deal & Walmer Angling Association, in conjunction with the National Federation of Sea Anglers, held a fishing competition on Deal Pier III a month before it was officially opened by Prince Philip, Duke of Edinburgh. Over a period of three days that the festival was held, a total of 280 anglers took part. The October weather of 1957 was partially subdued; with sunshine and a lack of wind for each day's fishing. This might have been the cause for not having a spectacular catch rate, although 875 fish were caught for a total weight of 411 lb 3 oz (186.512 kg). The festival took on an international theme with anglers from France attending, lead by Monsieur Hautin, president of the French Sea Angling Federation. Monsieur Mathieu, a member of the Institute Committee of International Competitions, won one of the major prizes, the Petch Cup, for the heaviest aggregate of round fish. He brought a total weight of 6 lb 5 oz (2.863 kg) to the scales. 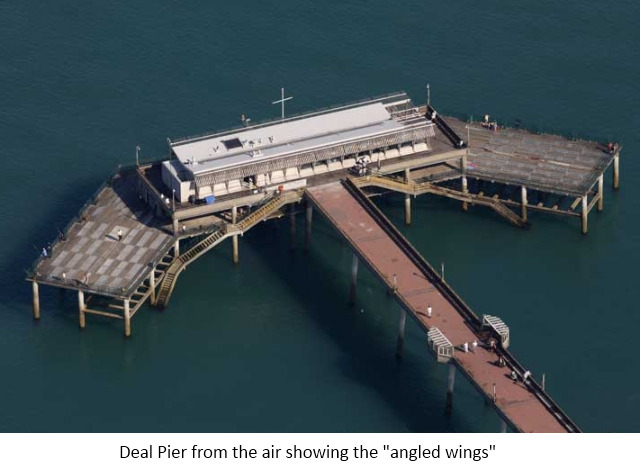 Alderman Albert Cavell, chairman of Deal Council's Entertainment Committee and Deputy Mayor, pointed out that this was the first time that the new Pier had been opened to the general public. Along with the clement weather it had attracted 11,000 people who visited the Pier over the three day fishing festival. Alderman Cavell had fished the competition and landed a total of 20 fish. He had spent time on the Pier during its construction and was pleased to hear many encouraging comments from both the visitors and anglers over the three days of fishing. He stated that he hoped that this would be the start of many more angling festivals in the town. 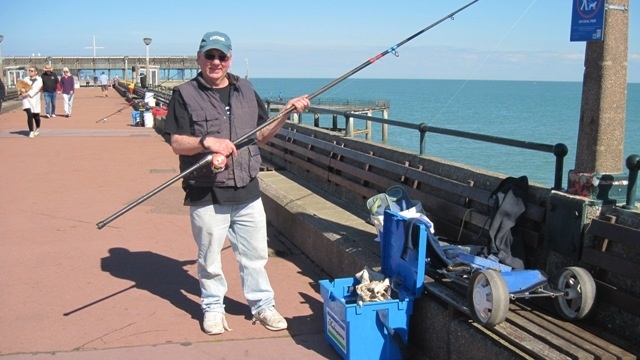 The most successful angler of the competition was Stan Culver from Margate. 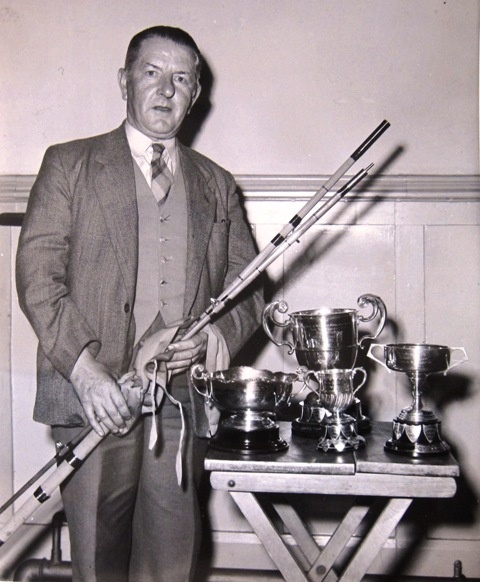 An angler all his life - since the age of five - he carried off four cups and five prizes. He had competed in many sea angling matches all over the country and had even taken a trophy at the French National Championships at Arromanches. Over the following years Stan was a regular match angler on the Pier and beaches until his death in 1974, aged 72. He taught his grandson, Dave Andrews, some of his angling skills and who has excelled in the competitive scene and is still a top class match angler. The town Mayor, Councillor Dunn presented the trophies and prizes to the winners. He stated that Deal was to be honoured by the presence of the Prince Philip, Duke of Edinburgh on the 19th of November to open the £250,000 new Pier. He also said that, after a 17 year lapse during which the town had not had one, the Pier would be the finest asset of the seaside resort. From 1957 the Pier has held many hundreds of fishing competitions. The three day events were phased out in the early 1960s into two day festivals. Nowadays, single events are more in line with the anglers' demands and there is still plenty of fish to be taken. Over the years lost tackle has mounted-up snagging anglers' lines resulting in losses. Occasionally the seabed around the Pier is dragged by a boat to remove these hazards; however, it is a problem that is lived with. There will be a celebration of the Pier's Diamond Jubilee on Sunday, 19th of November with an open fishing competition hosted by Deal & Walmer Angling Association (details to follow). Bobbing up and down, buffeted by the waves, a large German mine drifted towards the pier at a south-east coast town yesterday. Nearer and nearer it came. People were ordered from the pier. Others were told to leave the seafront. From a safe distance they watched the mine drift. It reached the pier. It went under the pier. Miraculously, it seemed, it danced in and out among the pier piling without hitting it. The waves took the mine nearer the beach. The watchers retreated, their eyes glued on the floating black object. They put their hands over their ears, crouching, waiting for what might happen as the mine made the last few feet of its journey. For some minutes, with waves breaking over it, the mine lay on the beach, rocking gently to and fro. Then experts dealt with it. 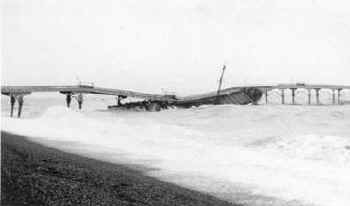 The mine was one of many washed ashore at this south-east town during the night and evening. In spite of them only one ship was struck - the Dutch motor-vessel Nora (350 tons), about a mile and a quarter from the shore. After being mined the Nora was towed shorewards and left lying on the sea bed fifty yards from the pier head with only her mast above water. Suddenly she came to life again, crashed through the pier, tore away the piling, promenade deck and upper structure, leaving a gap eighty to 100 yards wide. All six members of the crew were rescued, however. The cook, Heinrich Hes, was taken to hospital. He was buried in the debris when the explosion wrecked his galley. Crowds on shore watched a large German mine bob up and down through the maze of the piling underneath the pier of a south coast town yesterday. As the waves brought the mine nearer the beach - narrowly missing pile after pile - the people walked backwards. The last few feet of its journey were watched in silence by the crowd - some half crouched, hands over ears - waiting for what might happen. For a few minutes it rocked gently in the surf until experts arrived and made it harmless. Many mines were washed ashore during the night and morning. A drifting mine blew a small Dutch vessel, the Nora, into halves. Ashore, people were shaken in their beds. The Nora's stern was blown away and she began to sink so rapidly that only her bow was sticking out of the water when a salvage tugboat raced alongside. Her crew managed to make the hawser fast to the bow. By sheer force the tugboat towed the rapidly sinking ship to the shore. All the Nora's crew are believed safe and on board-another salvage vessel. Later, the rising tide lifted the ship further inshore and drove her through a pier. The pier, cut in two, had a huge gap between seventy to a hundred yards wide at the shore end. A small Dutch coastal vessel the Nora, struck a mine off the south-east coast yesterday, but was saved from sinking by a salvage tug. The tug's crew succeeded making a hawser fast and although the Dutch vessel's anchor was down, managed by sheer brute force to tow her until she was beached. It is believed that all her crew were saved by another vessel. Seeing the Dutch motor vessel Nora (351 tons) sinking rapidly after striking a mine off the South-East Coast early yesterday, a salvage tug dashed to her aid and, by a brilliant feat of salvage work, saved her from actually foundering. The crew of six were landed, three of them injured. The explosion shook people in their bed at a town on the coast. The Nora began to sink so quickly that only her bow was showing when the tugboat raced alongside and, by sheer force, towed her close to the shore. Later the rising tide lifted the Nora and drove her clean through the pier. "I find I have a link with Deal - I helped to rescue your pier master." "Yes, I remember you. You're the chap who had the curious cargo." "I was first officer in a tanker blown up by a mine in the Thames approaches in April 1943. Our cargo was petroleum jelly, which was kept liquefied by the boilers. As the tanker broke in two, petroleum jelly poured out and solidified in a layer quite five feet thick on the top of the waves. "As we rowed through this the destroyer Wallace came along. A fair haired lieutenant helped us up the scramble nets. Later I asked who he was. I was told: 'Lieutenant Philip.'" "I was very fond of piers as a child, but since I had to walk the whole length of Southend Pier (one and a third miles) during the war to get back to my ship, I haven't cared for them so much." As far as we know, our ancestors were all good honest Victorians from London, who often went on holiday to Deal. We believe this photo to have been taken in 1924/5. From left to right are my ancestors Lily, Emma Jane and Minnie Tooth. Emma Jane was my great grandmother and she is shown here with her two daughters. This photo shows my great grandfather Alfred Barham Tooth (waving) with his two daughters - from left to right, Lily and Minnie Tooth. The other people are presumably people local to Deal, hiring out boats at the time. Mr Turner, the film starring Timothy Spall as William Turner, Britain's finest marine artist, has been received with great acclaim. 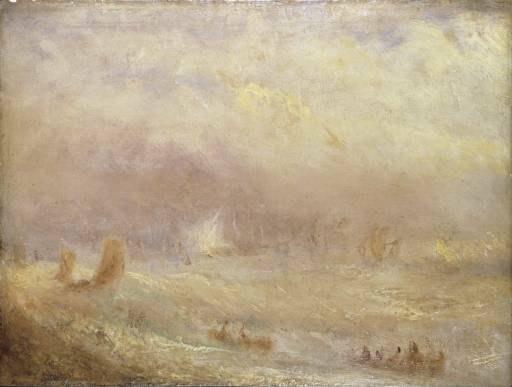 Turner (1775 - 1851) was introduced to Kent when he was sent from London as a young boy to stay with relatives. As a mature artist, he returned repeatedly to the coast, particularly Margate, where he was attracted by its spectacular sunsets. Eventually, he began a lifelong liaison with a wealthy widow, Sophia Booth, who kept a guest house on Margate seafront. From there, Turner - a grotesque, portly figure carrying his easel and umbrella that doubled as a fishing rod - traipsed around the coastline gaining inspiration for his spectacular seascapes. Deal is fortunate in owning an original painting by Turner; Deal in a Storm (1824) hangs in the Mayor's Parlour of the Town Hall. Its purpose was to be turned into an engraving for the series, Picturesque Views of the Southern Coast of England. 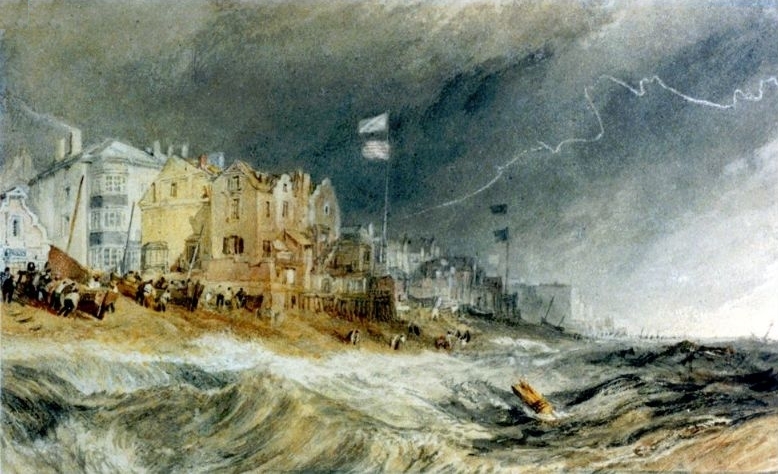 This exquisite watercolour presents a dramatic scene on Deal beach after a violent storm. Boatmen hastily prepare boats to be launched in a heavy sea to salvage a shipwreck on the Goodwin Sands. Wind-torn flags on their tall masts stand out against a louring sky, illuminated by a streak of ribbon lightning. This is the only instance where Turner introduces a full flash of lightning into one of his paintings. 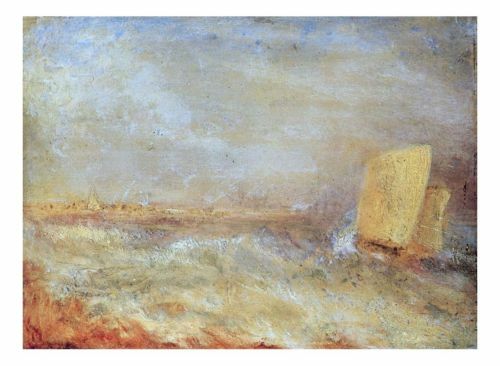 Surprisingly, Turner achieves a powerful effect by employing pastel shades - pinks, creams and greys. His meticulous details include the sails of the hovelling luggers, the design of the signal flags, the crumbling buildings with their smoking chimneys and curvilinear gables, and, in the far distance, the tiny silhouette of Sandown Castle. The artist made copious notes in preparation for this painting. His sketchbook survives and is preserved in the Tate Gallery. It includes vignettes of the Royal Naval Hospital, Walmer Road windmill, the Royal Exchange Hotel and the Royal Signalling Station (now the Timeball Tower) relaying a message in semaphore. Later, Turner, back in his London studio, worked up his sketches of the North End of Deal into a purely imaginary scene that perfectly conveys the atmosphere of our bustling port. Whilst at Deal, Turner took the opportunity to be rowed out to the Goodwin Sands. There he watched a cricket match organised by Captain Martin, harbour master of Ramsgate. His hastily chalked sketch is preserved at Yale Centre for British Art, Connecticut. Deal appears a second time as the subject for a Turner painting; Deal (circa 1826 - 1828) hangs in the Walker Gallery, Liverpool. Here the artist presents a turbulent scene where a Deal lugger is battling to reach a cluster of sailing ships caught in a sudden storm. Once again, the painting was intended for reproduction in a series of engravings. Its collective title, Harbours of England, is a misnomer because, of course, Deal never possessed a harbour. 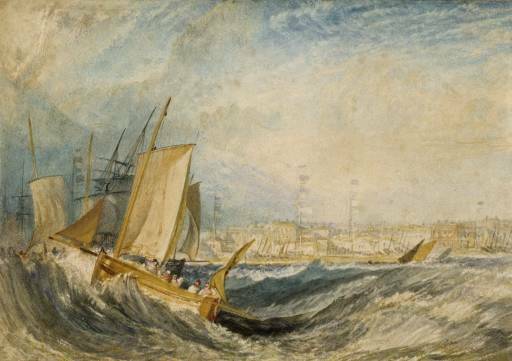 Two further paintings of Deal by Turner recently came to light; Off Deal is held by the National Museum of Sweden, Sailing Boat off Deal by the National Museum of Wales. Both these canvasses, painted late in life, are highly impressionistic. Features of the port are impossible to discern. Posing as Mr Booth, Turner moved, in middle age, to a Thameside house at Chelsea. His mistress, Sophia, retained a guest house in Deal. It was here that the pair removed when Turner contracted cholera from which, due to his robust constitution, he recovered. Despite Mr Turner's evident fortune, however, the doctor, summoned from Thanet, complained bitterly that he had never once received payment from the artist for his services. 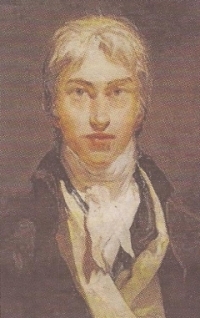 A short biography of William Turner is related in Gregory Holyoake's Deal - All in the Downs . Editor's Note: Gregory Holyoake is an actor, author and a schoolteacher who lives in Deal, Kent. He trained as a schoolmaster at Culham College of Education, Oxfordshire where he gained teaching diplomas in English Literature and Divinity. As an actor he trained at Rose Bruford College of Speech and Drama, Kent, before embarking on a theatrical career, appearing in repertory and repertoire worldwide. Gregory has been a photo journalist for forty years and he has appeared regularly in such prestigious national magazines as Country Life, Country Homes and Interiors, This England, The Lady, Illustrated London News, Heritage and Evening Standard. For five years he was chief reporter for Kent Life when he became an authority on Kentish subjects. He photographed Kent - The County in Colour for Dovecote Press and Scarecrows for Unicorn Press. He has also written a trilogy of local histories - Deal: Sad, Smuggling Town, Deal: All in the Downs and Wellington at Walmer while his boyhood in post-war Kent is described in detail in The Prefab Kid. If you have question for Gregory or would like some more information, or would like to just get in touch then you may contact him here. The appointment of the committee in 1833 arose out of the distress which was at that time said to affect the several Channel fisheries, and, in its reports, the committee stated that these fisheries were generally in a very depressed state and on the decline; that they appeared to have been gradually sinking since the peace of 1815; that the capital employed did not yield a profitable return; that the number of vessels and of the people to whom it gave employment was diminished; and that the fishermen who formerly could maintain themselves and their families by their industry were in a greater or less degree pauperised. The cause of this unfavourable change, to which, as being in its opinion the most readily susceptible of remedy, the committee gave its principal attention, was the interference of the fishermen of France and Holland; but the principal cause of the distress was stated to be "the great and increasing scarcity of all fish that breed in the Channel" compared with what was the ordinary supply forty years since; operating prejudicially to the fisherman, at the same time that a continual fall of prices has taken place in the markets. This fall of prices could not have occurred in consequence of any scarcity in the supply. That there was a diminished quantity taken by the English fishermen might possibly have been true; but considering that the supply in our markets was actually increased, so as to provide our growing population at progressively decreasing prices, I can only account for the facts adduced by the committee by supposing that the foreign fishermen, of whose interference such grievous complaint was made, were better skilled and more persevering in their calling than our own countrymen; a supposition which seems to be borne out by the circumstances of our having, since this report was delivered, been still more abundantly supplied with fish for our tables; while the cry of distress on the part of the fishermen has passed away, doubtless owing to the greater degree of skill and industry which they have since exerted. Editor's note: The second of the two scams - Kentish boatmen, at sea for five days fishing for sprats to sell as fertiliser, would hide contraband under a boat-load of five-day old rotting fish in the reasonable expectation that the smell would deter customs officers from carrying out a thorough search of the boat. This scam is still employed today to smuggle contraband into the UK and, in May 2016, a Polish lorry driver, Pawel Michal Maroszek, was caught smuggling 2.6 million fake cigarettes worth £655,327 into the UK hidden behind boxes of rotten apples and was sentenced in October to 21 months in prison. By the summer of 1807 smuggling in England and Wales had increased to what the Commissioners of Customs designated as an "alarming extent". An Act was therefore passed to ensure the more effective prevention of this crime, and once again the revenue officers were exhorted to perform their duty to its fullest extent. Further, they were threatened with punishment in the case of any dereliction, while rewards were held out as inducements to zealous action. "in some of the towns on the coast of Kent and Sussex, amongst which are Hastings, Folkestone, Hythe and Deal, but more especially the latter, the practice of smuggling is carried on so generally by such large gangs of men, that there can exist no hope of checking it but by the constant and most active vigilance of strong military patrols, with parties in readiness to come to their assistance". So wrote Mr. W. Huskisson, Secretary to the Treasury, to Colonel Gordon in August 1807. The Deal smugglers went to what Mr. Huskisson called "daring lengths", and for this reason the Treasury suggested that patrols be established within the town of Deal, and for two or three miles east and west of the same. And the Treasury also very earnestly requested from the Commander-in-chief every possible assistance from the Army. … It was the frequent practice of East Indiamen to arrive in the Downs and sell quantities of tea to the men who came out from Deal in small craft. The commodity could then be kept either for the use of their families and sold to their immediate friends, or sent up to London by the "duffers" in the manner we spoke of in an earlier chapter. In the instances when spirits were smuggled into the country there was usually some arrangement between the publicans and the smugglers for disposing of the stuff. But, you may ask, how did the Deal boatmen manage to get the tea to their homes without being seen by the Customs officers? In the first place it was always difficult to prove that the men really were smugglers, for they would be quite wide-awake enough not to bring obvious bales ashore; and, secondly, the Deal men had such a reputation as desperate characters that no officer, unless he was pretty sure that a smuggling transaction was being carried on and could rely, too, on being well supported by other Customs men and the soldiers, would think of meddling in the matter. But, lastly, the men who came ashore from the East Indiamen had a smart little dodge of their own for concealing the tea. The accompanying picture is no imaginary instance, but is actually taken from an official document. The figure is supposed to represent one of these Deal boatmen, and the numerals will explain the methods of secreting the tea. 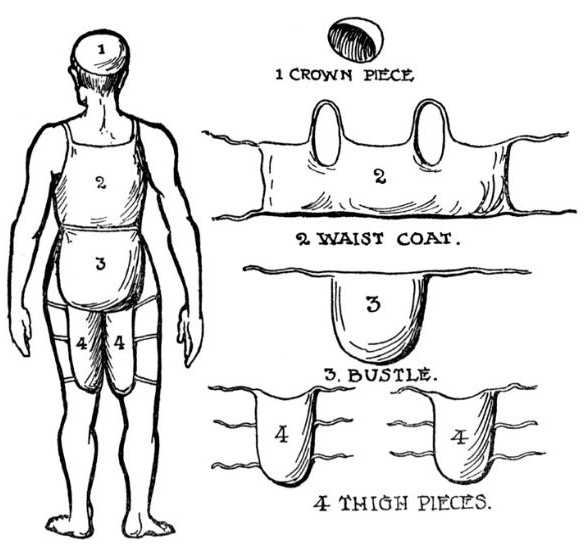 Indicates a cotton bag which was made to fit the crown of his hat, and herein could be carried 2 lbs of tea. He would, of course, have his hat on as he came ashore, and probably it would be a sou'wester, so there would be nothing suspicious in that. Cotton stays or a waistcoat tied round the body. This waistcoat was fitted with plenty of pockets to hold as much as possible. This was a bustle for the lower part of the body and tied on with strings. These were thigh-pieces also tied round and worn underneath the trousers. When all these concealments were filled the man had on his person as much as 30 lbs of tea, so that he came ashore and smuggled with impunity. And if you multiply these 30 lbs by several crews of these Deal boats you can guess how much loss to the Revenue the arrival of an East Indiamen in the Downs meant to the Revenue. Some time back we called attention to the way in which the Deal boatmen used to walk ashore with smuggled tea. About the year 1834 a popular method of smuggling tea, lace, and such convenient goods was to wear a waistcoat or stays which contained eighteen rows well stuffed with 8 lbs. weight of tea. The same man would also wear a pair of drawers made of stout cotton secured with strong drawing strings and stuffed with about 16 lbs of tea. Two men were captured with nine parcels of lace secreted about their bodies, a favourite place being to wind it round the shins. Attempts were also made to smuggle spun or roll tobacco from New York by concealing them in barrels of pitch, rosin, bales of cotton, and so on. In the case of a ship named the Josephine, from New York, the Revenue officers found in one barrel of pitch an inner package containing about 100 lbs of manufactured tobacco. Another old dodge, though different in kind, was employed by a smuggling vessel when at sea and being chased towards evening, or on one of those days when the atmosphere is hazy or foggy. To prevent her canvas from being seen against the horizon, the lugger would lower her sail, and her black hull was very difficult to distinguish in the gathering gloom. Treachery, crookedness, deceit, trickery, guile … Deal! "The town and parish of Deal lies adjoining to Sholdon north-eastward, being written in ancient writers, both Dola  and Dale; in the survey of Domesday, Addelam, taking its name from its situation - a low open plain upon the seashore." 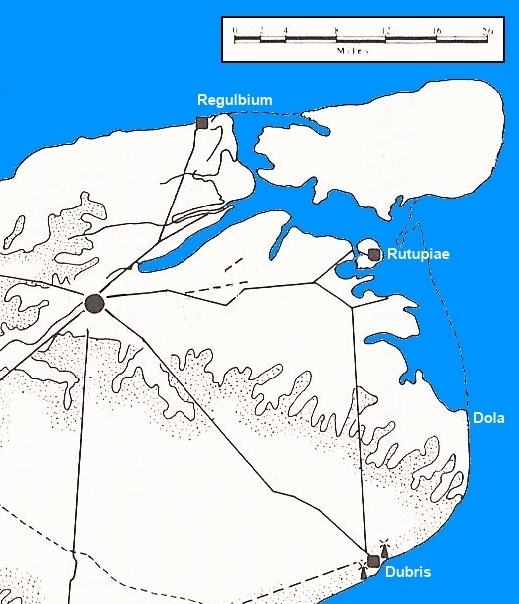 Eastern Kent has changed considerably since Roman-British times; the Wantsum Channel has completely silted up, connecting the Isle of Thanet to the mainland and the Claudian bridgehead port at Richborough now lies 2 miles (3.2 km) from the sea. Historians have often questioned why Julius Cæsar did not use the natural harbour at Richborough for either of his British expeditions, particularly the second one, and landed instead on the shingle beach between Deal and Walmer Castle. The only possible answer must be that the harbour did not exist in 54 BC, but by the Claudian invasion almost one-hundred years later (in AD 43) the harbour had been created, possibly by the titanic forces of a particularly violent - though unrecorded - winter storm. Nennius (a Welsh monk of the 9th century attributed with authorship of the Historia Brittonum) says "Cæsar ad Dola bellum pugnavit" ("Cæsar fought a battle at Deal"). William Baxter (1650 - 1723), in his "Glossarium Antiquitatum Britannicarum" published in 1719, suggests that this place was anciently so called from the crookedness of the shore; Dol being the same in the British, as (Dolos) in the Greek. In Greek mythology, Dolos is the spirit of trickery and guile; bait (figuratively), deceit (trickery) using bait to "hook" people; "deceit motivated by guile") uses decoys to snare (deceive) people which implies treachery to exploit the naïve, from δέλω (delo) to catch with a bait). Dolos is also a master at cunning deception, craftiness, and treachery. He is an apprentice of the Titan Prometheus, and Pseudologi. His female counterpart is Apate who is the goddess of fraud and deception. He was parented by the Gaia and Ather or Erebos and Nyx. Dolos became known for his skill when he attempted to make a statue of Veritas, again in order to trick people into thinking they were seeing the real statue. But he ran out of clay, which he was using to create the statue, and had to leave the task unfinished as he quaked in fear while his skill-master overviewed his attempt at deceitfulness. But to his surprise, Prometheus was amazed at the similarity between the statues - then Dolos became the master at his crafty and tricky ways. There are even some stories of Dolos tricking gods into lies. His Roman equivalent is Mendacius. 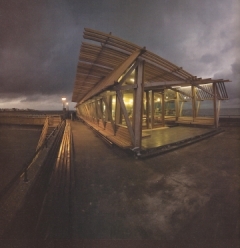 Deal Pier (AR July 2006), Kent, is a bare-bones structure that Níall McLaughlin Architects likens to the skeleton of a beached whale or the ribcage of a ship. Built on unadorned concrete piles, it has a pared down, matter-of-fact quality. Níall McLaughlin Architects concluded that its Deal Café and Bar should preserve an al fresco quality, providing an ideal setting for a cup of tea or supper at the end of the pier while dealing with the challenge of an endlessly changeable maritime environment. The architect set out to do this also in a pared down, matter-of-fact sort of way. Contextual and budgetary limitations underpinned the need for a building in which every component is essential. The modular, repeated structural frame has one kind of column and one kind of beam. A fringe of projecting hardwood slats shades the long east and west walls from the sun, with angled slats that retain transparency. Elements of the external structure double up to create essential windbreaks. The untreated hardwood frame exploits wind and salt in the prevention of mould and algae growth, and within a year it will have weathered to a silver-grey colour, matching the pier. Visit Deal Maritime Museum - "the second best kept secret in Deal". The Grand Designs presenter says Jacob's Ladder is the only house in Britain that takes his breath away. Jacob's Ladder was the staircase to heaven in the dream Jacob had as he fled his brother Esau in the Book of Genesis. It is also the name of an extraordinary house hidden among beech woods on the Chiltern Hills, designed and built at the beginning of this century. It stands on a steep slope where the land falls away into Oxfordshire and it, too, is like something conjured from sleep. The house was designed by Níall McLaughlin in his late 30s and was his first fully-fledged project. Since then Jacob's Ladder (Chinnor Hill, Chinnor, Oxfordshire OX39 4BQ) has won an award from the Royal Institute of British Architects, and McLaughlin's reputation has soared. 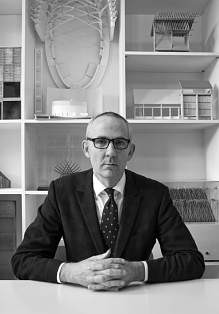 He is now working on buildings for Oxford and Cambridge colleges, retuning the Natural History Museum, teaching at the Bartlett School of Architecture, and has a philosophical interest in housing for the elderly. Last year he was named one of Britain's 500 Most Influential People by Debrett's. "There is only one house I can think of in the whole country that takes my breath away … This is how 21st-century rural houses should be designed." 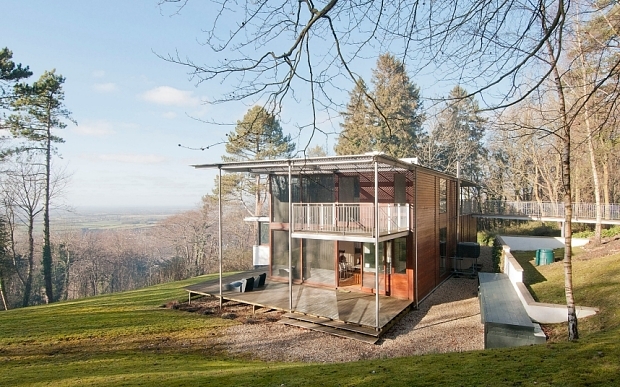 Níall McLaughlin, hugely influenced by Ludwig Mies van der Rohe and Pierre Koenig, has since made other wonderful houses including one at Pipers End in Hertfordshire, but his projects are an eclectic mix. He has, for instance, put a new café on Deal pier in Kent, which is tenacious and weatherproof as a limpet, and he is working on the massive Tapestry building in Kings Cross, London. "Published in 2002, it's about Kent. I guess you'd call it psycho-geography (emphasis on the word "psycho"), though this doesn't begin to capture its intense interest, its uncanny spookiness, the way it ensnares you, turning your stomach, messing with your head. As a reader, you're both afraid for and of its author, loitering at the book's edges, spinning his increasingly deranged yarns without ever fully explaining himself. At its end, he does something that comes as a shock, a thing I still wonder about. Unfortunately, this mystery - and countless others - will never now be solved …"
Click here to listen to the podcast and here to read Andy Beckett's 2002 review. 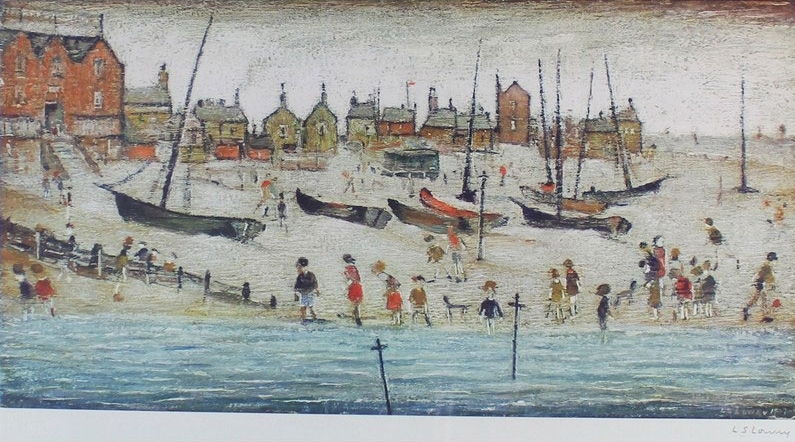 A Kent auctioneer is offering for sale two prints of Deal beach by L. S. Lowry. The painter came to Deal in 1912 and sketched the beach scene. It is simply called "Deal". 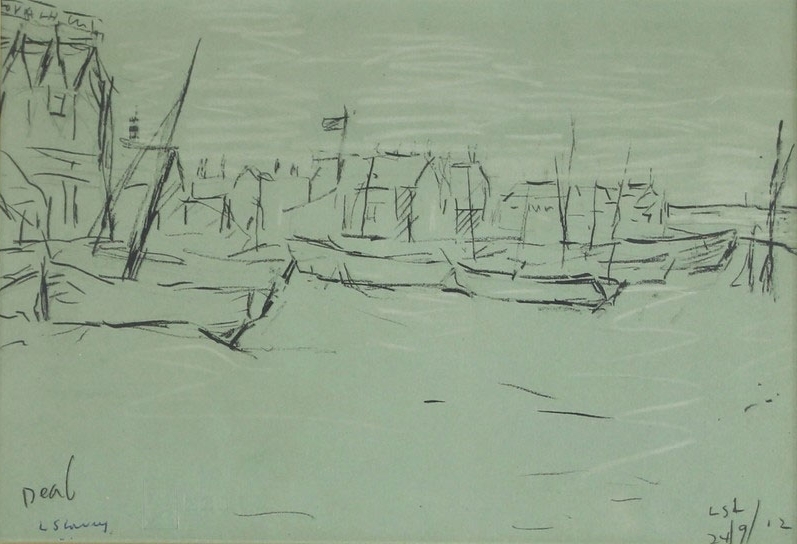 In 1947, he used the sketch as the basis for a full painting of the same scene called "The Beach". The auction will be held on 19th September, at 11 am, at 18 The Glenmore Centre, Pent Road, Shearway Business Park, Folkestone. Lot 102 Auction notes: Lowry, Laurence Stephen 1887-1976 British AR, "Deal", 6.75 x 9.75 ins., (17.25 x 25 cms. ), offset lithograph limited edition print published in 1973 by Venture Prints of Bristol from a sketch executed in 1912, signed in ink. The print is in its original frame and in excellent condition, it has been owned by the vendor since the 1970s. Lot 101 Auction notes: Lowry, Laurence Stephen 1887-1976 British AR, "The Beach" 10.25 x 20 ins., (26 x 51 cms. ), offset lithograph on wove paper, signed in pencil. "The Beach" was completed in 1947 using a sketch Lowry made titled "Deal" in 1912. In 1973 Venture Prints of Bristol made the the limited edition print, three colour offset lithograph. The vendor bought this print and "Deal" at the time and has owned them ever since. Both prints are in their original frames and in pristine condition. These two prints should be of considerable local interest, it is not often an image of Deal by a great artist comes up for sale in Kent. The large brick building is The Royal, as it is known locally, a hotel that gained some celebrity when Nelson enjoyed trysts with Lady Hamilton a century earlier. It looks very different now, but a photograph of the Royal in 1900 shows it to be exactly like the building in the painting. The frontage looks very different today with roads and tarmac Boats used to be drawn right up to the pavement edge. Few people know that Deal has the Time-ball, which drops at 13.00 every day. This clock was linked to the main one in Greenwich and was used by the fleets waiting at sea to set their timings for their navigation charts, otherwise they may have ended up far from their destinations.